Home >> Lesson Plans >> Teach the Real Story of the "First Thanksgiving"
Are you teaching the true Thanksgiving story or is the version you're passing on to your students a blend of fact and myth? Ready to set the record straight? "I propose that there may be a good deal that many of us do not know about our Thanksgiving holiday and also about the 'First Thanksgiving' story," says Chuck Larsen in the introduction to Teaching About Thanksgiving. "I also propose that what most of us have learned about the Pilgrims and the Indians who were at the first Thanksgiving at Plymouth Plantation is only part of the truth." "When you build a lesson on only half of the information, then you are not teaching the whole truth," Larsen adds. Larsen seems to know of what he speaks. As a public school teacher, a historian, and an American of Indian heritage, Larsen has always had a difficult time teaching about the Thanksgiving holiday. "Every year I have been faced with the professional and moral dilemma of just how to be honest and informative with my children at Thanksgiving without passing on historical distortions, and racial and cultural stereotypes," Larsen says in his introduction. "The problem is that part of what you and I learned in our childhood about the 'Pilgrims' and 'Squanto' and the 'First Thanksgiving' is a mixture of both history and myth," Larsen continues. "But the theme of Thanksgiving has truth and integrity far above and beyond what we and our fore bearers have made of it. Thanksgiving is a bigger concept than just the story of the founding of Plymouth Plantation." Larsen goes on to try to sort out the myth from the true history in his introduction to "Teaching About Thanksgiving," a project of The Fourth World Documentation Project of The Center for World Indigenous Studies. The project includes an accurate telling of "The Plymouth Thanksgiving Story" along with study and discussion questions, ideas for enrichment, art projects, and authentic recipes—all intended to enable teachers to accurately portray the events surrounding the first Thanksgiving. In closing his introduction, Larsen provokes with a question: "What started as an inspirational bit of New England folklore soon grew into the full-fledged American Thanksgiving we now know. . . . But was [that 'First Thanksgiving'] really our first Thanksgiving?" "There really was a true Thanksgiving story of Plymouth Plantation," Larsen says. "But I strongly suggest that there has always been a Thanksgiving story of some kind or other for as long as there have been human beings. There was also a 'First' Thanksgiving in America, but it was celebrated thirty thousand years ago. Every last Thursday in November we now partake in one of the oldest and most universal of human celebrations, and there are many Thanksgiving stories to tell." "Teaching About Thanksgiving" offers a handful of the "old stereotypes" that are often reinforced in classrooms across the United States. According to the article, "If you enact the story of the first Thanksgiving as a pageant or drama in your classroom, here are some things to consider:"
"Indians should wear appropriate clothing. NO WARBONNETS! A blanket draped over one shoulder is accurate for a simple outfit." "Squanto and Samoset spoke excellent English. Other Indians would have said things in the Algonkian language." "These people were noted for their formal speaking style." "Indians in the Woodlands area did not have tipis or horses, so these should not be part of any scenery or backdrop." "Any food served should be authentic. The following would be appropriate: corn soup, succotash, white fish, red meat, various fowl (turkey, partridge, duck), berries (including whole cranberries), maple sugar candies, corn starch candy (believe it or not, candy corn is almost authentic except for the colored dyes), watercress, any kind of bean (red, black, green, pinto), squash." Caleb Johnson, creator of the MayflowerHistory.com Web pages, claims that Larsen's "Teaching About Thanksgiving" contains many factual errors. Among the facts above disputed by Johnson is the idea that "Squanto and Samoset spoke excellent English." They spoke broken English at best, Johnson writes. "Young children's conceptions of Native Americans often develop out of media portrayals and classroom role playing of the events of the First Thanksgiving. That conception of Native Americans gained from such early exposure is both inaccurate and potentially damaging to others," says Debbie Reese in "Teaching Young Children About Native Americans," an ERIC Digest (May 1996). For example, a visitor to a child care center heard a four-year-old saying, "Indians aren't people. They're all dead." "This child," Reese says, "had already acquired an inaccurate view of Native Americans, even though her classmates were children of many cultures, including a Native American child." "By failing to challenge existing biases we allow children to adopt attitudes based on inaccuracies," Reese continues. "Most of the commercially prepared teaching materials available present a generalized image of Native American people with little or no regard for differences that exist from tribe to tribe," Reese adds. "Many popular children's authors unwittingly perpetuate stereotypes. Richard Scarry's books frequently contain illustrations of animals dressed in buckskin and feathers, while Mercer Mayer's alphabet book includes an alligator dressed as an Indian." A number of positive strategies can be used in classrooms, writes Reese. "Provide knowledge about contemporary Native Americans to balance historical information. Teaching about Native Americans exclusively from a historical perspective may perpetuate the idea that they exist only in the past." "Prepare units about specific tribes rather than units about 'Native Americans.' For example, develop a unit about the people of Nambe Pueblo, the Turtle Mountain Chippewa, the Potawotami. Ideally, choose a tribe with a historical or contemporary role in the local community. Such a unit will provide children with culturally specific knowledge (pertaining to a single group) rather than overgeneralized stereotypes." "Locate and use books that show contemporary children of all colors engaged in their usual, daily activities (for example, playing basketball or riding bicycles) as well as traditional activities. 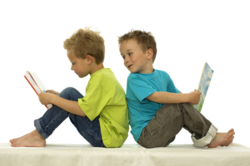 Make the books easily accessible to children throughout the school year. Three excellent titles on the Pueblo Indians of New Mexico are Pueblo Storyteller by Diane Hoyt-Goldsmith; Pueblo Boy: Growing Up In Two Worlds by Marcia Keegan; and Children of Clay by Rina Swentzell." "Cook ethnic foods but be careful not to imply that all members of a particular group eat a specific food." "Be specific about which tribes use particular items, when discussing cultural artifacts (such as clothing or housing) and traditional foods. The Plains tribes use feathered headdresses, for example, but not all other tribes use them." "Critique a Thanksgiving poster depicting the traditional, stereotyped Pilgrim and Indian figures, especially when teaching older elementary school children. Take care to select a picture that most children are familiar with, such as those shown on grocery bags or holiday greeting cards. Critically analyze the poster, noting the many tribes the artist has combined into one general image that fails to provide accurate information about any single tribe." "At Thanksgiving, shift the focus away from reenacting the 'First Thanksgiving.' Instead, focus on items children can be thankful for in their own lives, and on their families' celebrations of Thanksgiving at home." "Besides using these strategies in their classrooms, teachers need to educate themselves," Reese continues. "Stereotyping is not always obvious to people surrounded by mainstream culture. Numerous guidelines have been prepared to aid in the selection of materials that work against stereotypes." "Much remains to be done to counter stereotypes of Native Americans learned by young children in our society," writes Reese in the conclusion to her ERIC Digest. "Teachers must provide accurate instruction not only about history but also about the contemporary lives of Native Americans." Blast stereotypes with across the curriculum activities for students of all ages. Looking to cook up a feast of across-the-curriculum fun? The table is set with a plentiful selection of ideas. Dig in. It's turkey time: "Gobble, gobble, gobble...."
Increase your students' knowledge and skills when you use TURKEYS as a teaching theme.